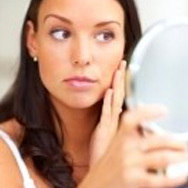 Choosing skincare products for acne or signs of aging is challenging enough when you're dealing with one or the other. But when you're struggling with both at the same time, it can be maddening. If you choose anti-acne products, you’re likely concerned they can make your skin dry or flaky, which makes the signs of aging even worse. On the other hand, if you use products to ward off signs of aging, especially if they’re creamy or thick, the breakouts and clogged pores will likely get worse. What to do? The fundamental answer to this dilemma is to use a mix of anti-acne products (that won’t make wrinkles worse) and anti-aging products (that won’t make acne worse). And, believe it or not, such products do exist! The anti-acne products must be formulated to be gentle, non-drying, and skin softening, yet still highly effective against acne. And the powerhouse anti-aging products you use must have fluid, lightweight textures without any pore-clogging ingredients. For anti-acne, the absolute best place to start is a leave-on, skin-calming exfoliant that contains salicylic acid (BHA). The other anti-acne product you need is one that contains 2.5% benzoyl peroxide, as this works with the salicylic acid to keep acne in check. For your anti-aging needs, you need to use the lightest formulas that are loaded with ingredients that help normalize and rejuvenate your skin so it’s ultra-smooth and radiant. These remarkable types of ingredients don’t have to have a cream or even a lotion texture; they can have a gel or fluid texture that hydrates but doesn’t clog pores. For your daily skincare routine, your skin will love our RESIST Essential or Advanced Kit for Normal to Oily Skin. Start there, and then consider adding other products. It can also be incredibly helpful to use our 10% Niacinamide Booster and 1% Retinol Booster. Abundant research has firmly established the roles of niacinamide and retinol in minimizing pores and their numerous anti-aging benefits, including improving the look of skin tone, loss of firmness, and wrinkles.